The trailer is everything and more that you advertised! I am very pleased. It took about 100 miles of driving to get used to the fact it was behind the SUV. I had to look in the lower rear view mirror to see if it was still back there. We used it to pick up a gun safe and transport about 80 miles. With the weight on it, it ran much smoother on the rough sections of the highway. Thank you for the quality product you made. I hope to increase your business! 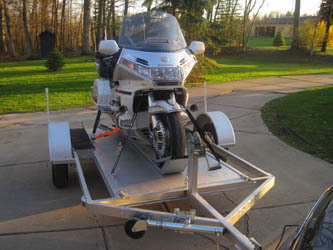 Hello Gary, Just thought I would let you know , I trailered my Goldwing to Florida last week and it rode like a charm. I went to visit a brother and sister in the Ocala area, spent a week riding around there, then went west across from Chattanooga to the Natchez Trace Trail. I rode the trail about 100 miles up to Nashville on the Goldwing with a buddy of mine following with my trailer. Then we loaded it up and hauled it back home to Michigan. I did 2500 miles in total. The trailer pulls like it isn't there. My car is a Lincoln Town Car, so in the hills I took it out of overdrive so that it would not keep shifting down. This may not have been necessary but I thought it made sense. I traveled 70 and 75 miles per hour right along with the traffic with no problems at all. I checked my tie downs pretty regular and they all stayed nice and firm. My main front tie down was on the forks rather than on the handlebars. I did the same on the rear crash bar, then added another strap front to rear off the front crash bar to keep it from lunging forward if I had to hit the brakes. It's a delight to load and unload without using a ramp. It makes me feel secure and in control. My white Goldwing on your silver trailer got lots of attention. Behind each fender, I added two 3 ft. high PVC posts with small lights on top that I can see while driving. These are a nice addition. I also added some side marker lamps, a carpeted footpad where the spare tire was, and a front jack with a wheel so that I can move it around when off the car. I rode with 30 pounds in the trailer tires to soften them a bit. I am glad I went with the larger low pressure tires. When loading and unloading, I don't even put the side kickstand down. I hold the cycle up with small temporary straps on the handle bars. Then when I hook up the main front tie down straps, I remove the small temporary straps. The same in reverse when unloading. 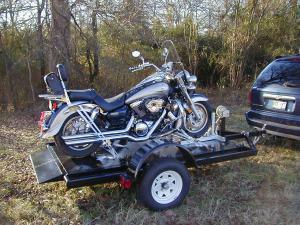 I rode thru some rain and was surprised how little dirt splashed on the motorcycle and trailer. I didn't even wipe it down to ride in Florida after driving for two days. I think the open trailer concept is good other than if one ran through ice and snow. Just thought I would let you know that I am very pleased with the trailer and how well it performs. If you ever reconsider manufacturing or marketing it here, let me know. Feel free to use my letter as a testimonial, or have a potential customer call me if they wish to talk with a satisfied customer. Just a note to let you know that my Razor Trailer has been to Durango CO, St. Ignace MI, Eastern PA, Rapid City ND and Bowling Green KY. In July it will be taking my 940# Kawasaki Voyager (shown on your site) to Santa Fe NM for our annual Rally, the trailer has more than 10,000 mi on it now and still looks good, kept in the garage. Hi Gary, I wanted to say thank you for such an incredible trailer. I loaded the 748 today and took the trailer for a quick trip simply to test it out and it is amazing. Really simple for one person to load and attach to the hitch. Your design is top notch. DEAR GARY, AS A WOMAN RIDING & SOMETIMES TRAILERING A LARGE H-D MOTORCYCLE ON MY OWN, MY HUSBAND WAS CONCERNED ABOUT ME LOADING & UNLOADING THE BIKE SAFELY. WITH THE RAZOR TRAILER I PURCHASED IN 2006, THE PROBLEM WAS SOLVED, AND WHAT A REACTION I GET WHEN I DO! PEOPLE STOP & WATCH WITH GREAT FACINATION (EVEN MY LOCAL H-D SERVICE PEOPLE). THEY CAN'T BELIEVE THAT SUCH A BIG BIKE (SOFTTAIL DELUXE) CAN BE UNLOADED SO EASILY IN JUST A SHORT TIME. IF THEY'RE RIDERS THEMSELVES, THEY TAKE NOTE OF THE WEBSITE ADDRESS CLEARLY PRINTED ON THE SIDE. I HOPE SOME OF THEM CALLED & PLACED ORDERS BECAUSE I KNOW THEY WILL NOT BE SORRY IF THEY DID. THANKS GARY FOR MAKING SUCH A GREAT PRODUCT! Well here we are about 4 years later and the trailer has about 30K miles on it without a problem. A simple wheel bearing repacking every spring and it's good to go. It's hauled Goldwings, an Ultra Classic, an organ, a piano, lumber, furniture, a refrigerator, a deep freeze, furnaces, air conditioners, a boiler, a sheet metal break, and a little "Barbie" electric car birthday present for a granddaughter. I pulled it for a while with a Ford Windstar minivan and didn't know it was behind me. Now it's following a new Tundra and it still is unnoticeable. I had a flat in Orlando and put the bike on the trailer to go to Daytona for a tire during Bike Week. I drew a large crowd when I was unloading the bike. Seem I upset the gentleman who was trying to sell a loader that lifts the bike on a rather heavy deck into the back of a pickup. Maybe it was the truck bumper nearly hitting the ground that was turning people away? Good job Gary! Gary, I just wanted to let you know that I've used my trailer to pull my bike home, to Kentucky, and back to Alabama. The trailer is great! I was very pleased with the ease of use and how well it pulled. Thanks, again. It was a pleasure dealing with you. Dear gary - I have used my new Razor Trailer twice since I took delivery in late may and I must tell you it is a breeze to operate. It is an excellent engineering design. I could not be more pleased. Gary- I used the trailer last weekend. I was very impressed with the ease of use and stability. It rides straight as an arrow. Everyone that has seen it work is shocked. Thanks for building me such a great trailer! Gary: I bought one of trailers in 2003 and you delivered to Savannah. Just wanted to send you a message sharing with how happy I have been with your trailer. I bragg about your trailer every chance I have the opportunity. If you ever need a reference from a very satisfied customer please do not hesitate to give them my phone number. Hi Gary, I just got back from Florida. The trailer did great. It tracked beautifully and took the bumps with ease. Loading and unloading is a breeze. Thanks again. Gary, I have used my trailer a few times now and it is actually better than I expected. Today one of the Harley service people and two other bikers came over and watched me load my ultra classic. The service guy said it was the best trailer he had seen and one of the bikers said he was going to google "Razor" as soon as he got home.